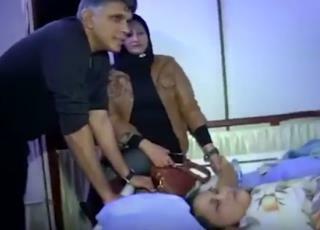 (Newser) – It took two months of preparation and could take more than four years of treatment, but doctors are determined to help the person believed to be the world's heaviest woman survive. The Times of India reports that Eman Ahmed Abd El Aty was flown Saturday from her home in Egypt to Mumbai, India, where in March she'll undergo a weight-loss surgery called sleeve gastrectomy, which reduces the stomach to a fraction of its size. In the interim, medical staff hope to spur Abd El Aty—whose family thinks she weighs more than 1,100 pounds and who suffers from a litany of conditions, including Type 2 diabetes, hypothyroidism, and hypertension—to lose more than 100 pounds beforehand by feeding her a protein-heavy diet and giving her meds to help curb water retention. To be that size at such a young age... It has to be hell living like that. I'm praying they can help her. Good gaaad, really don't understand this.. I will never understand how people can amass this kind of weight and not seek help. At about 300 pounds, how can they not recognize how serious it is? And to continue to gain even more.. to the point where you are bedridden?? I really wish i could understand the mindset that allows one to ignore or justify this extreme morbid obesity and simply not care.